During terrain analysis, the planner should consider observation and fields of fire, cover and concealment, obstacles, key terrain and avenues of approach. Fear not, we will not go into a full blown terrain analysis but rather make just a few considerations. For this scenario, and besides the paramount objective St. Vith, I want to make sure that I can observe and block the enemy reinforcements from the west. To achieve that, I will need clear route to our left flank. The right flank is no less important. 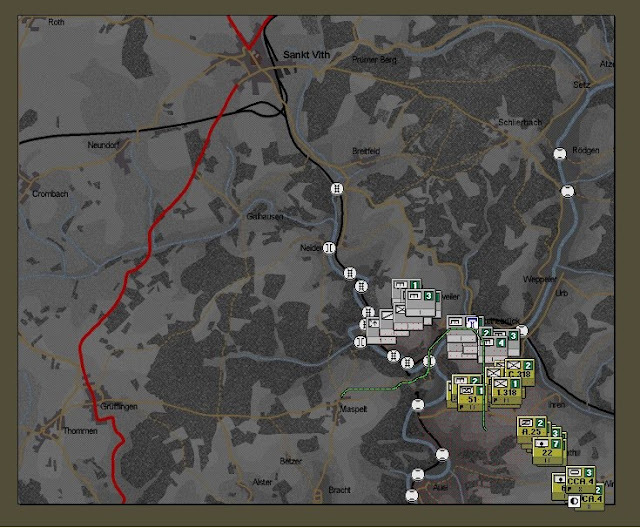 I wonder if the routes southeast of St. Vith are controlled by the enemy. Although the maps in the game are as informative and seamless as real ones, I sometimes miss-read them (i.e. fail to perceive a natural obstacle). Thank goodness we have a tool available in the game that allows to evaluate the movement between two points of choice. The "path" tool (yellow box) will calculate a route between two points of your choice. In this case, I asked for a calculation of the shortest path for motorized units moving from our line of departure to objective St. Vith (green line). A similar path calculation. Movement to our left flank will be only possible after controlling the bridge to our north. 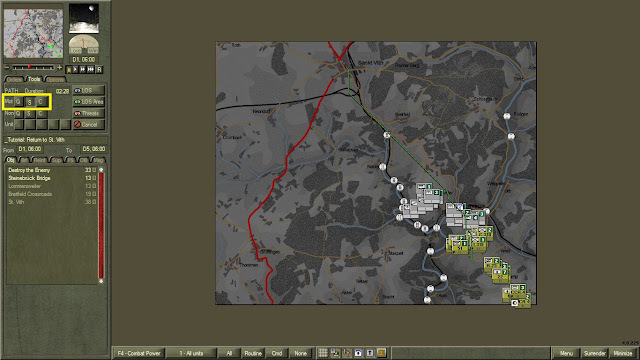 Movement towards our right flank, only after we control the bridge to our north. In conclusion, we can't bypass the enemy in front of us and we will need to take out those enemy units before going for any other objective. Coming next, our own troops. This sounds like a really interesting game, thanks for sharing. I am not sure however, if the first calculated path in this post, is realistic. The hills around St. Vith are quite steep at places and crossing the fields is ok bu then driving down into the valley might warrant a road. 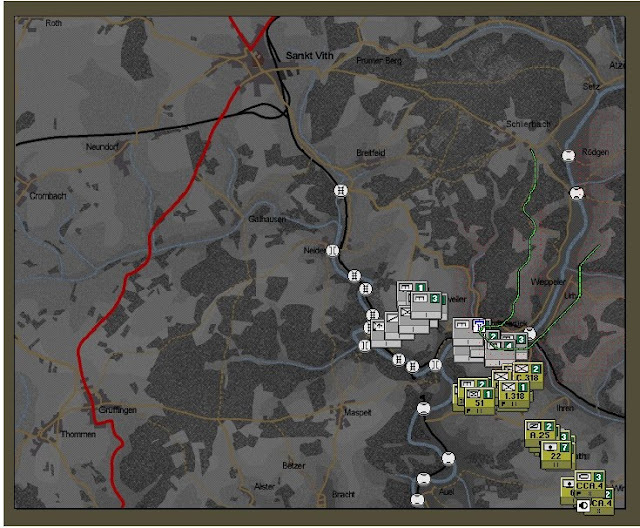 Still interesting to see this part of warfare, the planning bit, highlighted in a game. Will we see a post in which the plan is executed? SM, sir ... how are you these days. The other day I got an Armchair General mag at an airport and thoroughly enjoyed it. You still writing for them? As for gaming: scarce these days. Hopefully when the summer ends!